Kemp is believed to have torn his labrum crashing into a wall in Colorado on Aug. 28. He and the Dodgers were hoping the damage would be relatively minor and require nothing more than a cleanup, but Dr. Neal ElAttrache decided the labrum had to be repaired - that is, reattached to the socket. The Dodgers issued a statement stating ElAttrache expects Kemp to be ready for opening day. The All-Star center fielder will begin physical therapy in seven to 10 days and is expected to start swinging a bat in early January, according to the team. I think it's likely he'll be less than 100%. First baseman Adrian Gonzalez underwent a similar procedure in October of 2010. He was limited to 11 games the following spring. "I didn't have a lot of power in April, but I got hits and everything," Gonzalez said. "Once May rolled around, I felt pretty good." Gonzalez hit only one home run that April for the Boston Red Sox, but he finished the season with 27. We've got far to many players coming back from big injuries next season. Hopefully, the off-season brings about some healing. Ya know, this photo doesn't make me feel better about the off-season. 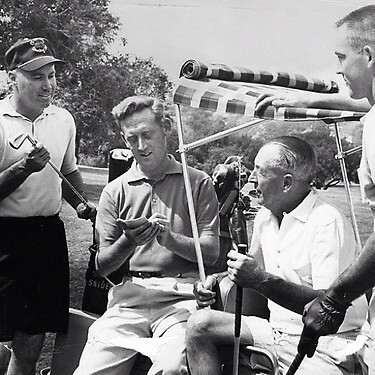 The above photo tweeted by @Dodgers features Vin Scully and Duke Snider taking in a round of golf. Best tweet ever! 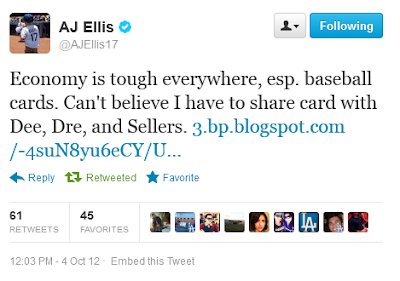 From AJ Ellis. BTW, if you haven't seen his card yet, go here. Ramona Shelburne at ESPN writes an excellent piece on Dodgers owner Mark Walter. "What I don't think people got about that trade is we wouldn't just throw money away to make the team slightly better. It's gotta make sense," he said. "I feel like the people we got are people we should be able to count on as a core group of players for a long time. We got a good young first baseman who happens to be about the same age as the guy in right field, and shortstop, and center field." Alex Pavlovic at Giants Extra shares a story about Vin Scully from the last game of the year. But I’ll never say anything bad about Vin Scully, especially after what I saw Wednesday. Scully walked over to the Giants clubhouse in the afternoon to congratulate Bruce Bochy and wish him luck in the postseason. Bochy was on the phone and Scully, a legend, waited patiently in a corner as a few coaches came over to shake his hand. He left before getting a chance to talk to Bochy, but made sure to stop by and leave a message with one of the coaches. “Please congratulate him, and tell him that I wish you guys the best of luck in the postseason,” Scully said. Check out Mike Petriello's Dodgers Fan Guide to the Playoffs. Then, check out his piece at RotoGraphs about why Andre Ethier didn't live up to expectations. This is probably the most irrelevant piece of Dodger news to come out the past few days. The Dodgers completed their trade with the Red Sox by sending Rubby De La Rosa and Jerry Sands to Boston, via a Dodgers press release. Now with the 2012 season over it is time to show your Dodger Blue support by voting for Clayton Kershaw. Go here. I want to hate Sergio Romo right now (after all, he's a Giant), but I just can't. 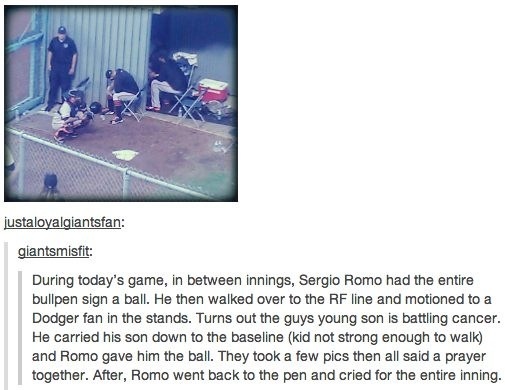 Via Reddit, Romo earned the respect of many Dodger fans with a gesture towards a child battling cancer. After what felt like months of waiting, I finally had an opportunity to spend some time with the object of my winter season obsession. Wednesday was my day to spend some time with Lord Stanley's Cup, and I'll have you know that I still can't wipe this grin off my face. 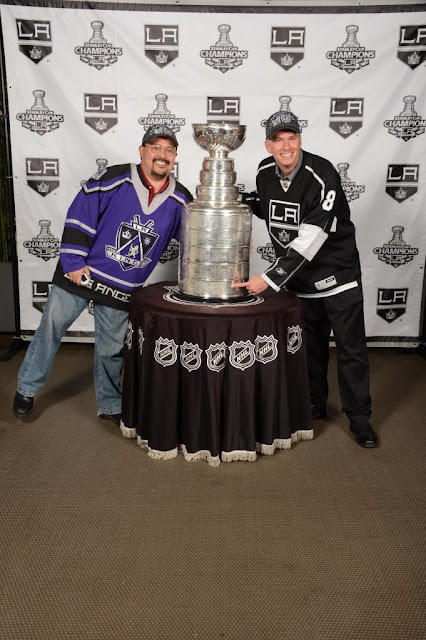 As a season ticket holder, the Kings made arrangements for us to go to the Home Depot Center (home of the LA Galaxy) in order to have our moment with the Cup. While at the stadium, there were a bunch of new banners featuring the Stanley Cup Champion Los Angeles Kings celebrating. Then, my season seat friend and I took our turn in front of the camera. I slowly walked over, put my arms around that giant silver chalice, and gave it a big hug. I starred at it lovingly like a man who just found his long lost love. Then, I positioned myself to its side, and gave the camera the biggest smile I could. Heck, I didn't even have to try. 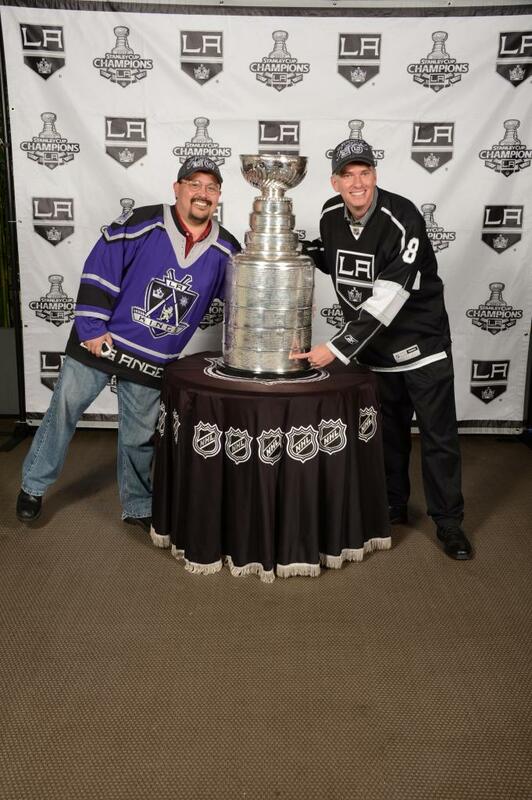 As you can see above, my friend decided to point at the LA Kings inscription on the bottom of the Cup. Just a week or so before, the NHL officially engraved it with the names of the Kings players and staff. Seeing it was a sight to behold. As I was walking out I saw another championship trophy glimmering in the sun. Below is the MLS Cup (actually named the Philip F. Anschutz Cup- owner of the Kings) that was won by the LA Galaxy in 2011. It not as grand as the Stanley Cup, but is still impressive looking. BTW, as I suggested in the title to this post there are a few more public opportunities for fans to take their photo with the Cup. Go here for information. The Kings are making the Cup available for public viewing and photos at four stops from Oct. 10-12. Below is a brief rundown of the events. Those who pay for admission for the park have a chance to visit with the Cup between 2:30-4 p.m..
Space/Time is limited – not all patrons will have access. Those who buy a ticket to the Kings’ Ice Crew calendar launch party will get to attend the party and get a photo opportunity with the Cup from 7-10 p.m. Cost: $50/person – includes: entry, the new calendar, access to take a photo with the Cup, free games and more. The Cup will be available for photos between 11 a.m.-1 p.m. The Cup will be available for photos between 11 a.m.-2 p.m. Here are some rare Brooklyn Dodgers memorabilia items that are currently available through Heritage Auctions. 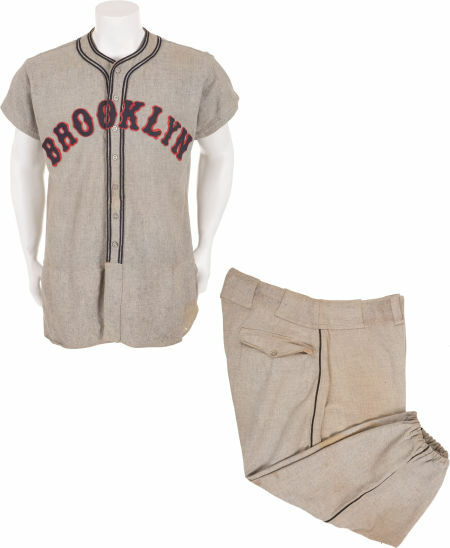 Below is a 1935 Brooklyn Dodgers game-used jersey by second baseman Tony Cuccinello. He was known as a very able hand on the field, and was an All-Star for the Dodgers in 1933. In fact, he struck out to end the All-Star Game against Lefty Grove. This Dodgers jersey below is very different from what we've seen from the Dodgers. This particular style was only used from 1934 to 1936. 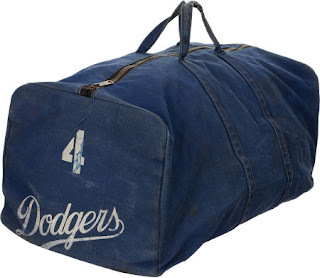 Here is a vintage Dodgers equipment bag that once belonged to Duke Snider. 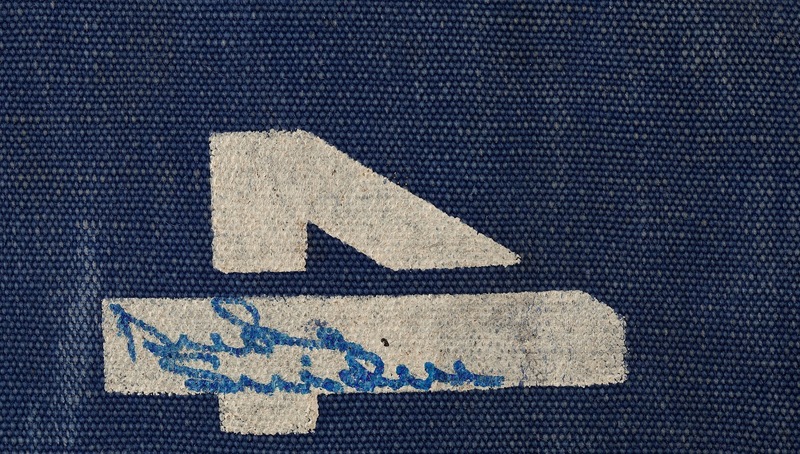 His uniform #4 is painted on the side, and his autograph is scrawled on top. This is very similar to an equipment bag that sold last year through Lelands Auctions, but is not the exact same one. 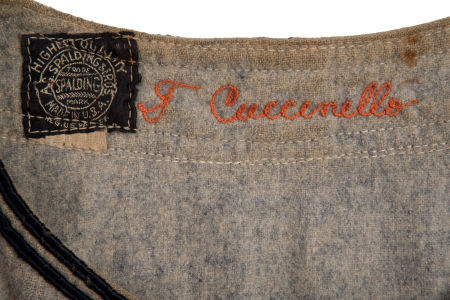 That bag sold for $768.47. I wonder what this bag will sell for. On Wednesday, Topps released their UPDATE Set to their flagship Baseball card set. As expected there are whole bunch of inserts and parallel variation cards; including some short printed Baseball cards. In fact, their are 7 different short printed Dodgers variation cards (actually 6 since one of them is a Sabathia card with a Kemp sitting nearby). Go here to see them all. 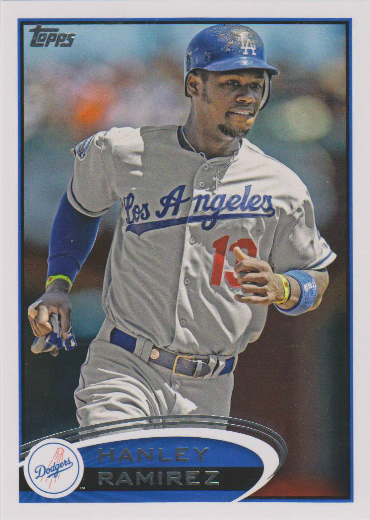 For this post, I feature all of the base Dodger cards in the set. See them below.